Most motorists on U.S. 395 through Washoe Valley probably don’t even notice the crumbling stone and brick walls that appear to be melting into the mud and grass in an open field adjacent to the northwest edge of Washoe Lake. But those walls, along with an historic marker located on a large boulder along the side of Old U.S. 395, are among the few reminders of once-thriving saw mill and quartz mill industries located in Washoe Valley. In Nevada’s earliest days, the early 1860s, there were more than a dozen such mills erected in the valley to provide lumber for Virginia City’s booming mines and to reduce and process its rich ore. The mills had names like the New York, the Manhattan, the Buckeye, the Napa, the Alfred and the Ophir. The walls beside 395 are the last vestiges of the Ophir Mill, a quartz mill and reduction works that was once one of the busiest in the valley. Befitting such a lucrative operation, the name, Ophir, is derived from the name of the legendary port where the fabulously wealthy King Solomon received his cargo of gold and other treasures. “The largest quartz mill in this county, and, with the reduction works attached, the most extensive establishment in the (Nevada) Territory, is that of the Ophir Company, in Washoe Valley,” noted J. Wells Kelly, author of the “First Directory of Nevada Territory,” published in 1862. Historical records indicate the mill was built in about 1861 and abandoned after about 1866, when Virginia City’s mine operators shifted their business to mills closer to home, such as along the Carson River near Empire City. A small community, also named Ophir, cropped up in the flats to the east of the mill. By 1862, Ophir had a post office and several hundred residents; for a time it was the second largest town in Washoe County after nearby Washoe City, which had an estimated population of about 3,000. Not surprisingly, the closing of the mill marked the beginning of the end for Ophir. By mid-1871, the post office had closed and most of the community’s residents had moved on to more profitable places. Over time, the structures associated with Ophir have begun to disappear. 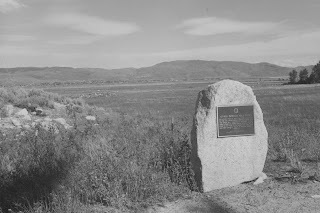 In 1961—on the centennial of the founding of the community—the Nevada Sagebrush Chapter of the Daughters of the American Revolution erected the historic marker on the boulder adjacent to Old U.S. 395. Then-Governor Grant Sawyer dedicated the monument. The site of Ophir was once again in the news on May 31, 1983, when it was nearly submerged by a 15-foot wall of mud that flowed down the southeast side of Slide Mountain. The slide was triggered when a snow-covered portion of Slide Mountain collapsed and crashed into Upper Price Lake. According to news accounts at the time, the mud, water and debris formed a dam in the lake, which gave way and sent a wall of liquid muck into a lower lake, where it gained additional traction and spilled down the mountain and into Washoe Valley. One person was killed by the slide, which also destroyed seven homes and inundated numerous vehicles. In recent years, neglect, weather and the elements have accelerated the collapse and disintegration of the two remaining stone and brick walls of the old Ophir Mill. Soon, all that will remain will be a pile of gray and red rubble. Looking out across the vast emptiness of the Owens Valley, it is hard to imagine that 70 years ago this place was the breadbasket of eastern California. Now, where the wide (100 square miles) but shallow Owens Lake (50 feet at is deepest spot) once stood, you find miles of cracked, dry earth. Fields once ripe with fruits and vegetables are gone. In 1904, the city of Los Angeles began pumping water from the Owens River and lake to supply its growing population. In 1907, the massive Los Angeles Aqueduct was completed, which begun sucking water from the valley and carrying it south. By the 1920s, Los Angeles had purchased most of the hundreds of small farms that once thrived in the region. Within a few years, the once fertile Owens Valley began to resemble its emaciated neighbor to the east, Death Valley. Today, in addition to servicing travelers on Highway 395, residents of the Owens Valley also mine the soft ores found in the alkaline sink that is Owens Lake. The first explorer to see the lake and valley was John C. Fremont, who named it for Richard Owens, an associate, who never saw the area. By the 1860s, settlers had moved into the region, which had previously been inhabited by Paiute, Mojave and Shoshone tribes. Rapid development of the region began in the late 1860s with the discovery of the Cerro Gordo silver mine, located in the mountains east of Owens Lake. The many small farms and ranches in the valley found the mining communities in the mountains were a ready and willing buyer for their produce, hay and livestock. In the early 1870s, Colonel Sherman Stevens constructed a flume on Cottonwood Creek, which rose high into the Sierra Nevada range, to the west of Owens Lake. Lumber from the Sierras was moved down the flume to a sawmill he built in the valley. From the mill, Stevens moved his lumber, used to timber the mines and construct buildings, to a dock (called Stevens Wharf) that he built on the west side of Owens Lake. From there it was placed on one of two steamers and transported across the lake to a landing on the other side. Freight wagons carried the wood to the mines. In addition to carrying lumber and supplies to the mines, Stevens also constructed a pair of large, adobe ovens to produce charcoal for the Cerro Gordo Mine. The steamers, called the Molly Stevens and the Bessie Brady also carried ore from the mines across the lake to freight wagons that shipped it to Los Angeles (this mineral wealth contributed to that town’s rapid growth, which, ironically, would later have such a negative impact on the valley). About the only survivors of this era are the two adobe charcoal ovens, constructed by Colonel Stevens in 1873. 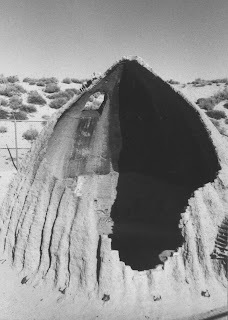 Neglect, time and the harsh surroundings have seriously damaged these mud beehives—which look a bit like giant hornet nests—but it’s still possible to get an idea of their size. Large openings at the top allowed logs cut to a special size and width to be placed into the ovens, where they were slowly burned down to charcoal. Doors at the front allowed the charcoal to be removed. Much of the front sides of both ovens has caved in over the years (the ovens were abandoned nearly a century ago), and one has to wonder if they’ll still be standing much longer, despite some modest attempts at preservation. The Cottonwood Charcoal Ovens, a California Historic site, and Owens Lake, are located about 250 miles south of Carson City via Highway 395. The ovens are located about one mile from the highway via a graded dirt road that is signed. For more information, contact the Eastern California Museum at 155 Grant Street in Independence (about 20 miles to the north of the charcoal ovens). The museum is open daily from 10 a.m. to 5 p.m., 760-878-0258. Among the items on display at the museum are the remains of the steamships, Molly Stevens and Bessie Brady, that once plied the waters of Owens Lake. Neon defines Las Vegas. Glowing, brightly color tubes of gas shaped into words and images played a major role in creating the city’s splashy image. Fortunately, while Las Vegas hasn’t done much over the years to preserve much of its history, it has treated many of its classic old neon signs a little better. Several years ago, when the city created the electronic canopy known as the Fremont Street Experience in the downtown area, it also decided to display some of its most historic neon signs near the entrance to the Experience. 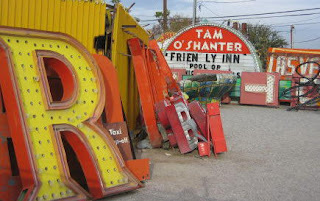 This cluster of vintage signs constitutes the Las Vegas Neon Museum. Of course, the primary reasons these signs aren’t entombed in a museum building are that some of quite large and were meant to be publicly displayed—they are signs after all. The reason that so many of the city’s historic neon signs exist today is that the company that manufactured many of them, Young Electric Sign Company (YESCO) maintained for many years a graveyard for signs in Las Vegas. There, literally dozens of old neon signs were stored. About a decade ago, YESCO agreed to allow the signs to be refurbished for the Neon Museum, which was established in 1996. The first sign, installed on the corner of Las Vegas Boulevard and Fremont Street, was the Hacienda Horse and Rider, originally erected in 1967 at the Hacienda Hotel on the Las Vegas Strip (the hotel was blown up a few years ago). Historically, the first neon signs in Las Vegas began to appear in the 1930s on Fremont Street. Initially, the signs were modest and merely advertised the various hotels and casinos. • Aladdin’s Lamp - This giant neon replica of an old-fashioned oil lamp was first lit in 1966 at the Aladdin Hotel. When that hotel was torn down in the 1990s, the sign was saved. In 1997, it was restored to its former glory and installed on the northwest corner of Fremont Street and Las Vegas Boulevard. • The Flame - Originally installed in 1961, this neon sign in the shape of fire was perched for many years on the roof of the Flame Restaurant on Desert Inn Road. • Andy Anderson - This cheerful milkman, the mascot for Anderson Dairy, first appeared in 1956 at the dairy located on Las Vegas Boulevard South. it was moved downtown to the Neon Museum in 1997. • Chief Hotel Court - The oldest sign in the museum’s collection, this classic motor court sign boasts an Indian chief in full headdress and art deco-style lettering (including neon letters spelling out “Steamed Heat”). Originally erected in 1940, the sign was originally located on the hotel at 1201 E. Fremont Street. • The Red Barn - This sign dates circa 1960. It was made by YESCO and installed on a bar of the same name at 1317 Tropicana Avenue. The bar burned to the ground but the sign was saved. Additionally, on East Fremont, four new 40-foot-high retro neon signs of showgirl, red shoe, etc. that compliment the historic neon and are part of the city’s $5.5 million expansion of the downtown entertainment district. Perhaps the coolest place to view old (and unrestored) neon is the Neon Boneyard, the storage area for the city’s signs that may one day be restored. There, surrounding the restored lobby of the historic La Concha Motel (saved and moved to the Boneyard to serve as a visitors center), are hundreds of old signs. The Boneyard is located at the north end of Las Vegas Boulevard (821 Las Vegas Boulevard North) near Cashman Center. At the present time, it is only open by appointment. Peeking through the fence, you can see the over-sized skeletons of many of Las Vegas’ most recognizable signs including the original Binion’s Horseshoe marquee, the high-heeled women’s shoe that once topped the Silver Slipper Casino and a curved Golden Nugget entrance sign. For more information, go to the museum’s web site, www.neonmuseum.org/tour. To most travelers on Interstate 80, Golconda is just a name on a sign you pass on the way from Winnemucca to Elko. More knowledgeable road travelers might recognize the word as Indian (as in the country). Indeed, railroad officials named the town in honor of an ancient city in India. 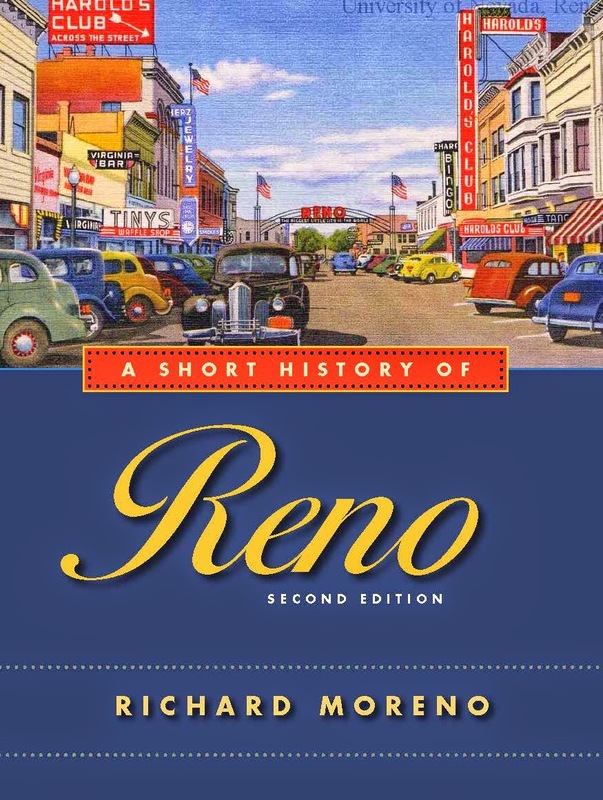 Golconda is a small hamlet that despite its somewhat modest appearance has played a part in many of the important events essential to the development of the west and the founding of the state of Nevada. The town of Golconda is located 16 miles east of Winnemucca, adjacent to Interstate 80. The area was first noted in the reports of explorer Peter Skene Ogden, who, in 1828, passed through the region while tracing the course of the Humboldt River. Later, when large numbers of wagons began crossing Nevada on their way to California, the place now called Golconda became a stop on the famed Emigrant Trail because of its natural hot springs. You can still find traces of this route north of the town. The hot springs, in fact, have remained one of the aspects of Golconda that continue to make it unique. In 1868, the Central Pacific Railroad established an ore shipping station near the hot springs to ship gold ore found in the Gold Run mining district, located 12 miles south. A small resort was constructed to provide weary transcontinental travelers with a place to relax. In the latter part of the century, Golconda was notable because it became the starting point for an ambitious canal project that was to carry local water 90 miles to the mines at Mill City. The canal eventually reached Winnemucca, but was abandoned before it was completed because it leaked more water than it carried. In 1897, there was renewed mining activity at Adelaide, located about 11 miles south of Golconda, and a narrow gauge railroad was built (called the Golconda and Adelaide Railroad). The town sprouted to more than 500 residents, including several hotels and a post office, but the excitement quickly subsided when, in 1899, the mine was closed and the railroad ceased operations. About seven years later, the mines, mill and railroad reopened, but once again proved unprofitable and all were shut down for good by 1910. In the late 1930s, a large chemical plant was constructed outside of the town to treat ore from new manganese-tungsten discoveries, but it was closed by the end of World War II and dismantled in the early 1950s. Mining has continued, however, since the 1930s at the Getchell and, later, Pinson mines, located about 20 miles north of Golconda. The original hot springs hotel, which became regionally famous in the early part of the century, burned in 1961. Today, visitors will find Golconda to be a sleepy roadside hamlet. On the corner of the main street (parallel to the interstate) and the road leading to the center of the town is one of those great-looking 1930s-style gas stations that once lined Highway 40 (predecessor to Interstate 80). Now part of a private residence, the station, which is in good condition, still boasts its old gas pump, which reportedly pumped its last ounce of octane in the 1970s. 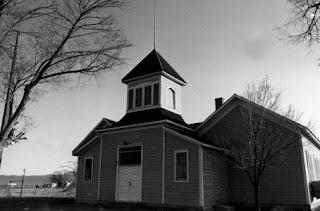 The town also has a striking gray and white, red-roofed school house, boasting a classical Victorian architecture. The building, constructed just after the turn of the century, now serves as a community center. Standing guard over the quiet community is the original railroad water tower, a large black cylinder on stilts. Less than a mile west of the water tower, you can also find the remains of Golconda's famed hot springs: a large pond of warm water fed by a few of the 12 springs found in the area. About four miles west of Golconda is Button Point, a highway rest area that also happens to be one of the best places to view the incredible winding of the Humboldt River. Here, you can look out for miles across a relatively undeveloped landscape and truly see what Nevada must have looked like to the early explorers and pioneers.